Google have updated their Google Now service adding some cool new features to the already impressive pocket search companion. The update focuses on new automatic and voice-activated features that makes travelling easier during the holiday period. To begin with, Google Now will automatically tell you what the weather will be like at your destination so you’ll know what type of clothes to pack before hand. When you get near your airport Google Now will automatically bring up your boarding pass so there won’t be a need to stand in those long lines or use those kiosks unless you’re checking a bag. The feature is not functional yet, but when it does go live it will be launching with support for United Airlines only. We’ have been told that other airlines will soon be added to the list as well. 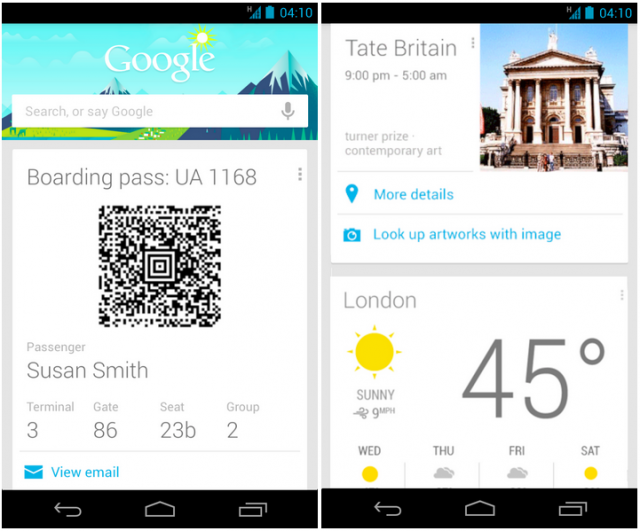 Google Now will let you know where to go for fun and sight-seeing once you’ve arrived at your destination. It will either tell you about events going on at that moment or direct you to websites where you can find out where all the tourist attractions are for you and your family to indulge into. Now coming to the voice activated features mentioned earlier, Google Now can identify what song is currently being played through the ““What’s this song” command, scan a barcode using the “Scan this barcode” command and also update your Google+ status message within seconds by uttering the words “Post to Google+” followed by whatever message you want to say. Sounds cool doesn’t it ? The update has started rolling out now and should be arriving on all Jelly Bean devices as we speak. Google my friend, you have done it again !